Denis Hurley reports from Turner’s Cross. 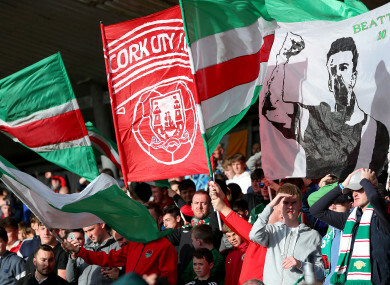 PREMIER DIVISION LEADERS Cork City’s double hopes remain firmly alive after an easy victory over Athlone Town booked their place in the FAI Cup on Friday night. In front of 1,669 people at Turner’s Cross, the Rebel Army hit their stride right from the off as Kieran Sadlier headed home Karl Sheppard’s cross and the pattern of the game never changed thereafter. It was 2-0 on ten minutes, Sheppard finishing smartly from Robbie William’s ball over the top and another defender, Shane Griffin, was the architect for Connor Ellis to make it three on the half-hour. Further chances followed and in injury time Garry Buckley netted, Sheppard again with the assist. That was Buckley’s last action as he was withdrawn at half-time, Achille Campion replacing him and the French striker was to play a prominent role in the second half. After Athlone keeper Igor Labuts tipped over a Sadlier curler on 60, Campion headed home Griffin’s delivery from a corner and it Labuts’ save from another Campion header saw Ellis net the rebound for 6-0. At the very end, the seventh goal came, Campion with his second after Sadlier set him up. Cork City: Mark McNulty; Steven Beattie, Robbie Williams (Pierce Phillips, 67′), Ryan Delaney (Conor McCarthy half-time), Shane Griffin; Conor McCormack, Garry Buckley (Achille Campion half-time), Karl Sheppard, Jimmy Keohane, Kieran Sadlier; Connor Ellis. Athlone Town: Igor Labuts; Liam McCartan, Owen Folan, Stephen Walsh, Seán McGrane; Dragos Sfrijan, Robert Spelman (Claudio Silva half-time); Conor Layng, Ryan Gaffey (Joe Carmody 56), Etanda Nkololo; Enda Curran (Peter Walsh 74). Elsewhere, there was a huge shock in Stradbrook as Bluebell United knocked out First Division Cabinteely. Shane Stritch found the net in the first half and it proved the only goal of the game as 10-man Bluebell, who had former Republic of Ireland midfielder Keith Fahey sent-off for a tackle on Kieran Marty Waters, held firm in spite of some fierce pressure in the second period and progress to the next round. Crumlin’s Bangor Celtic very nearly pulled off another surprise as they welcomed Longford Town to the Iveagh Grounds. They held Neale Fenn’s side scoreless for 71 minutes before substitute Don Cowan wriggled free of a couple of tackles before powering his shot beyond Stephen Conlon in the Bangor goal. And at United Park, Drogheda easily swept aside the challenge of Cork outfit Cobh Wanderers. Shane Elworthy scored twice in the first-half before Chris Mulhall added a brace in the second period. David Stack pulled one back for the guests but Thomas Byrne added another for the hosts in stoppage time. Additional reporting by Eoin O’Callaghan. Email “Cork City run riot and put a magnificent seven past Roddy Collins' hapless Athlone Town”. Feedback on “Cork City run riot and put a magnificent seven past Roddy Collins' hapless Athlone Town”.